The Lotus and the Artichoke – Vegan Cookbook launched on Kickstarter today! I can hardly contain my excitement and anticipation! These last two weeks I’ve been so unbelievably busy with the preparations for today. I’m proud to announce the project is finally live, the trailer video for the cookbook is finished and online, and we’ve officially begun the fundraising to back the first printing of The Lotus and the Artichoke – Vegan Recipes from World Adventures. It also means that as of today, now you can place a pre-order for the cookbook – both printed and as ebook – to be sent to you in early December. Here’s where you can read more about the cookbook and the publication plans. We have 30 days to reach our goal of $6500. I want to be as optimistic as possible, but I need to be realistic: I cannot do this without your support. I really hope to meet and exceed the financial goal and have enough funding to also publish the German version of the cookbook by the end of the year. I’m doing something that means a lot to me. I want it to mean something to you, too. Let’s make it a reality! Printing books is expensive. Especially when done all nice and fancy like I do. Nice covers, nice paper, lots of full-color photo pages, and a great design. The rewards will be high-quality as well: good shirts, decent cloth carry bags. My art materials are costly: I use good stuff. The prints are done on handmade Japanese hemp paper and I use an excellent German printing ink. The acrylics for paintings are an investment. Lastly, I do have editorial and translation help on this project. I compensate people properly for their quality involvement. For all these reasons, this project needs greenbacks. Some of my friends are telling me I’m crazy for pricing my rewards so low. 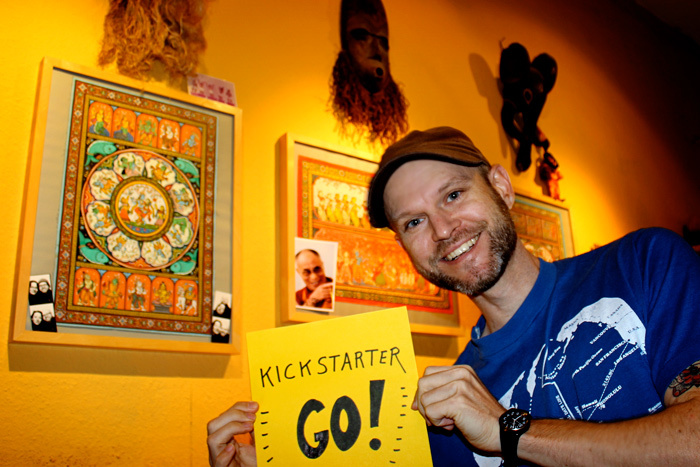 Most people use Kickstarter as a way to just bring in the big bucks and rely on generosity based on that good feeling you get from being nice. I think that’s dandy, but I also want all my backers to get cool stuff and to TALK about the fun perks I built into the project. On one end of the scale, you can throw in a few bucks and spread the word. If hundreds of people do that, it helps plenty! I’ll be grateful. Pitch in a bit more and you get a cool, personal postcard with fancy stamps from my next trip. Or pre-order the cookbook. Get a stylish T-shirt with some of my art, or get in on the fashionable Berliner hipster game with one of my cloth carry bags. Like my artwork? I’ve also got limited edition blockprints. I also plan to introduce even more fancy rewards in the next weeks. Hold on to your hats. There are already some BIG rewards! Am I nuts to propose I’d go (almost) anywhere in the world on your instructions to create new recipes and artwork? Maybe. I like to think it’s a cool kind of crazy. I’m adventurous enough to accept the bare minimum in financial support to make the trip possible. Would I fly to a new location in Europe, all-expenses included, to stay with locals and learn a new cuisine and create cool new recipes for the book? Yes, I would. How can I possibly do that for under $1000 – especially if that money’s needed for printing the cookbook? Well, I have lots of experience with traveling on a budget. Back in 2001, I spent 4 months in India and Nepal for less than $2500, including my airfare and all transportation costs. I also spent less than $1000 on a 4-week trip through Portugal, Spain, and Morocco. And it’s just the way my priorities work. If I want to travel somewhere, I find a way to make it happen. I’m so into the idea, I’d travel for this project and for fundraising purposes even if it doesn’t financially break even. You see, I have this belief that if you really passionately believe in something you can make it real, one way or another. I believe all things will come together when you really focus. Things fall into place, even if differently than planned. Of course, you’ve got to work hard to make it happen, too. I’ve been very busy! It’s not all daydreams and visualization exercises over here! I do my homework, too, when it comes to the practical and rational aspects of making a dream materialize. Stuff like moving abroad, learning languages, crossing continents, and launching creative enterprises. 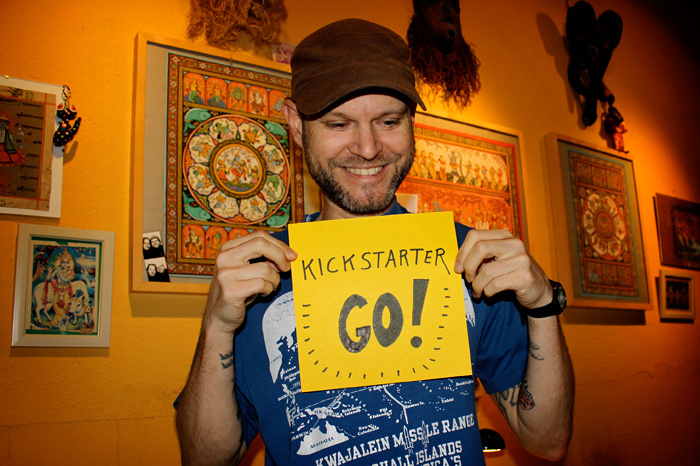 Share my Kickstarter page with your friends and followers on Facebook and Twitter. Be proud of your support! Contact me for more information about interviews, guest blog posts, feature articles, and other publicity + promotion! This entry was posted in Kickstarter and tagged kickstarter, vegan cookbook. Bookmark the permalink.